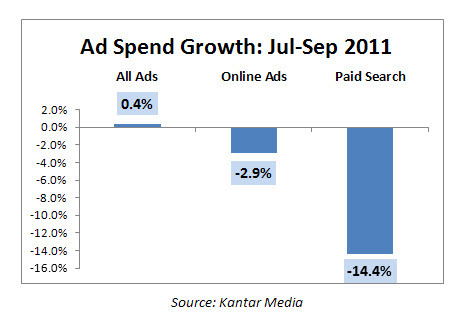 According to data recently released by Kantar Media, overall ad spending in the US essentially held steady the July-September 2011 time frame (as compared to the previous three months). Of this, however, internet media spending (which includes display and paid search ads) declined 2.9% in that same period. Even more noteworthy: paid search spend by itself dropped 14.4%. It’s too soon to tell if this is a temporary thing, or the harbinger of something to come. However, one thing’s for certain: advertisers – including b2b advertisers – are in full cost cutting mode. However, before you start “hackin’ and slashin'” your ad campaign budgets, lay the machete down and pick up the scalpel. A little tactical cutting here and there may drop costs noticeably without necessarily reducing sales and/or leads. 1. Review your paid search campaign performance. Look at the metrics of each of your campaigns. Identify those campaigns with low conversion rates, high costs per sale/lead, and high overall cost. Look at the keywords that you’re bidding on in those campaigns, and note candidates for pausing or reducing bids. Then look at the actual search terms that are triggering your ads, marking any terms that either need to be “negatived out” or placed in a separate group. Spending time in these reports will give you a good feel for where your money is currently going – allowing you to redirect cash flow to those areas that are most productive. 2. Review your paid search creative. 3. Review your landing page metrics. 4. Evaluate your ad spend by marketing channel. Review the figures for total sales/leads, total costs, conversion rates, and profits. After going through all these, you’ll have enough information to rank each channel in order of descending performance. Once this is done, you’ll have a much clearer idea about where to focus your efforts. You may want to pause the lower-ranked channels while you’re using your scalpel on the others. Cost-cutting is always a priority, but it gets much more attention during times of economic uncertainty. The key is not to react out of fear, but rather review the metrics and make decisions dispassionately. You may find that a certain amount of surgical cutting goes a long way toward bringing costs back in line. Next post: Helicopter of the Future?